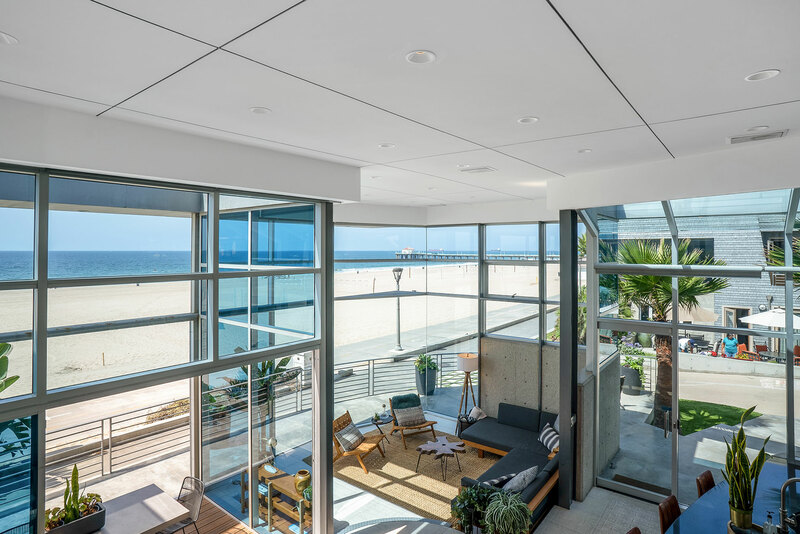 Private beachfront home on the coveted Manhattan Beach Strand. Allow your dream vacation to unfold while in the comfort of mid-century modern design. 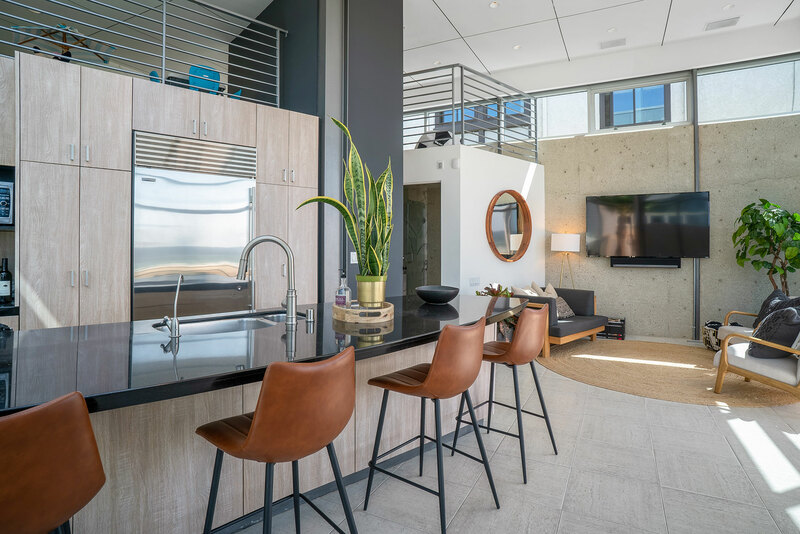 You’ll enjoy your pour-over coffee (or wine) on the sunny, large patio and watch the surf breaking on the sand. You’ll decide if you’re stand-up paddling, playing volleyball, riding bikes, or just relaxing on the sand. All these activities are steps away. 180 degree views of Catalina, Malibu, spectacular sunrises and sunsets, and (if you’re lucky) dolphins, seals, and grey whales! If you’re seeking a unique experience with lasting memories, you have found the right home. 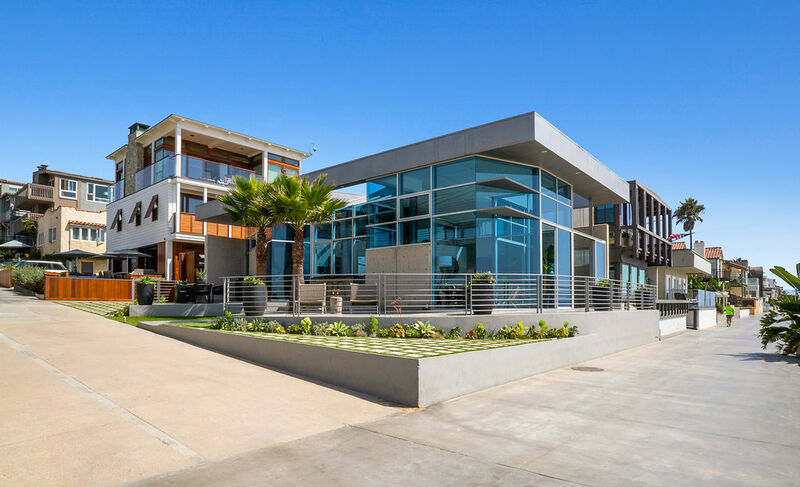 This iconic Manhattan Beach home sits at one of the most desirable residential intersections in Southern California: 7th Street and The Strand. Under new ownership and recently remodeled, this home is perfect for a family or couples who want to experience the absolute height of the Manhattan Beach lifestyle. This fully furnished, two bedroom (plus loft), two bath home comfortably sleeps 6 people with king beds in both bedrooms and a king in the loft. Subzero and Thermador appliances, Sonos sound system, Nespresso coffee maker (as well as chemex and french press), reverse osmosis drinking water filtration, 6 person dining (outdoor), lightning fast (100Mbps) internet, 70 inch TV, beach toys (beach cruiser bikes, stand up paddle boards, surfboards, boogie boards, skim boards, beach chairs, beach umbrellas, towels, shovels and kids sand toys, etc) teak furniture, and motorized shades. One of the unique features of Manhattan Beach are pedestrian streets called the “walk streets.” This home is on the 7th Street walk street. Downtown Manhattan Beach is a 5 minute stroll down the strand (the boardwalk along the beach) where you have access to some of the best shopping and dining in Southern California. Want to venture beyond Manhattan Beach? Take a bike and peddle along the sand to Hermosa Beach, Redondo Beach, Venice Beach, and Santa Monica. Manhattan Beach is only 15 minutes from LAX and easily accessible to all the shopping, dining, and entertainment of Los Angeles.